External Affairs Minister Sushma Swaraj met Nepal President Bidhya Devi Bhandari and held talks with CPN-Maoist Centre chairman ‘Prachanda’. She assuring them that India will work with the recently elected government in the country and provide assistance in Nepal’s development. Swaraj met Prime Minister Sher Bahadur Deuba. On Thursday, she met CPN (UML) chairman K P Oli. Swaraj conveyed to all the political leaders that India was looking forward to support the Government of Nepal, as per its priorities, in its endeavors for rapid economic growth and development. During her talks with Bhandari, Swaraj congratulated her on the successful conduct of election in Nepal. Latest International Current Affairs Feb 3 Updates from around the globe. Bhutan opens a consulate in Guwahati, Assam. It is the second country to set up its consulate general in the Indian subcontinent after Bangladesh. The event coincided with the 50th anniversary of the Bhutan-India relationship. 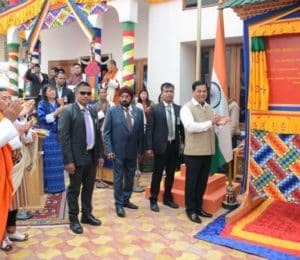 Bhutanese foreign minister Damcho Dorji and Assam CM Sarbananda Sonowal opened the consulate in the presence of Bhutanese PM Tshering Tobgay. Dorji announced a Bhutan-Guwahati-Singapore flight service would be launched. Donald Trump to host Australian PM Turnbull. US President Donald Trump will host Australian Prime Minister Malcolm Turnbull at the White House on Feb. 23. White House said in a statement that “The president and prime minister will discuss a range of shared bilateral, regional, and global priorities, including fighting terrorism, promoting economic growth, and expanding security and defense cooperation in the Indo-Pacific region,”. Both the leaders last met in November on the sidelines of a summit of East and Southeast Asian leaders in Manila. The meeting included Japanese Prime Minister Shinzo Abe, and the three leaders discussed trade issues and the threat posed by North Korea’s nuclear program. The Republican president became irritated that he was expected to honor an agreement made by his Democratic predecessor, Barack Obama, to accept 1,250 refugees. Trump and Turnbull apparently smoothed over their differences in a face-to-face meeting in New York in May. Check out the latest trending business Current Affairs Feb 3 updates by reading the news. Amazon.com posts a profit of nearly $2 billion, the largest in its history. Amazon.com reported a profit of nearly $2 billion, the largest in its history. The world’s largest online retailer’s net income more than doubled to $1.86 billion, or $3.75 per share in the fourth quarter ended December 31. Net sales increased 38 per cent to $60.5 billion, compared with $43.7 billion in the year-ago period. However, international business witnessed a loss of about $3 billion, largely due to spends in India. The company, which is competing with home-grown Flipkart, is burning cash to offer discounts for capturing the growing Indian market. Amazon reported about $3.06 billion losses from international operations for the year ended 2017, against a loss of $1.2 billion last year. Centre includes non-tech ventures for Tax Exemptions. The Union Budget for 2018-19 has not only extended tax exemption for start-ups by two years but also changed the definition to widen the ambit beyond technology-related venture. Startups that are incorporated on or after April 1st, 2016 but before April 1st, 2021 will be eligible for this benefit. Earlier, start-ups eligible were the ones with turnover less than Rs 25 crore between April 2016 and March 31, 2021. This has now been eased to allow start-ups with a turnover not exceeding Rs 25 crore to avail the exemption over seven years commencing from the date of incorporation between the years 2016 and 2021. Till April 1, 2018, only those start-ups will be allowed to claim tax benefits that are involved in innovation, development or commercialization of new products, processes and services driven by technology or intellectual property. Apart from the benefits on the taxation, the finance ministry has also introduced measures to help raise funds. Sony CFO Yoshida to replace CEO Hirai. Sony Corporation said on Friday that CEO Kazuo Hirai will be replaced by the company’s CFO, Kenichiro Yoshida, effective from April 1. Hirai, who stepped in as CEO in 2012, will become chairman of the electronics and entertainment company. During Hirai’s six-year tenure, Sony has exited or cut back in areas such as PCs and TVs, and capitalized on the spread of smartphones with its image sensors. Yoshida is widely credited for being behind many of the changes, which have won over investors. Sony is forecasting record profit for the year through March. Fidel Castro’s son Fidel Castro Diaz-Balart dies. The eldest son of late Cuban revolutionary leader Fidel Castro, Fidel Castro Diaz-Balart, committed suicide on Thursday. He was 68 years old. Diaz was being treated for months for depression. 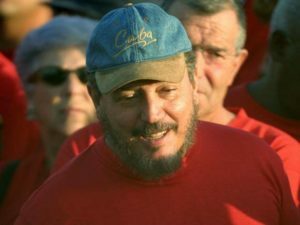 Castro Diaz-Balart, also known as “Fidelito”, or Little Fidel, was initially hospitalized for depression and then continued treatment as an outpatient. Castro Diaz-Balart, who had been attended by a group of doctors for several months due to a state of profound depression, committed suicide this morning,” Cubadebate website said. Fidelito was born in 1949 out of his father’s brief marriage to Mirta Diaz-Balart. Through his mother, he was the cousin of U.S. Representative Mario Diaz-Balart and former U.S. congressman Lincoln Diaz-Balart. Diaz is a nuclear physicist who studied in the former Soviet Union, Castro Diaz-Balart had been working as a scientific counselor to the Cuban Council of State and Vice-president of the Cuban Academy of Sciences at the time of his death. Current Affairs Feb 3 is bringing you with Records, titles and other updates from the world of sports. PV Sindhu enters India Open Semi finals. Top seed PV Sindhu reached the women’s singles semi-finals but Saina Nehwal, was knocked out of the India Open. Saina, who reached the finals at Indonesia Masters last week, looked a little sluggish in her movement was defeated 10-21, 13-21 by World No 11 American Beiwen Zhang. Olympic silver medallist Sindhu, recovered from a mid-game slump to outwit Spain’s world no 36 Beatriz Corrales 21-12, 19-21, 21-11 in the other quarter-final. She will next face 2013 World champion and world no. 3 Thai Ratchanok Inthanon. Mixed doubles pair of N Sikki Reddy and Pranaav Jerry Chopra, who had reached the semi-finals at Japan Open last year, entered the final four again here after beating Chinese combo of Han Chengkai and Cao Tong Wei 21-8, 21-13. Caroline Wozniacki loses in the quarter-finals of the St Petersburg Ladies Trophy. Australian Open champion and world number one Caroline Wozniacki lost 7-6 (7/2), 6-3 to local player Daria Kasatkina in the quarter-finals of the St Petersburg Ladies Trophy. Fresh from her first ever Grand Slam title the Dane had raced to the quarter-finals here but had been expecting the Russian to give her a difficult time. Fourth seed and Defending champion Kristina Mladenovic of France made an important step to retaining her title with a straight-sets win over Czech Katerina Siniakova. Mladenovic, ranked 10th in the world, prevailed 6-4, 6-3 to book a semi-final spot and to record her second win over the 21-year-old Siniakova in their fifth head-to-head meeting. Mladenovic will now face Kasatkina. Candidates hoping to get Government Jobs can get more details about the Current updates from above links. You can read some latest Current Affairs, and attempt Current Affairs Quiz which helps you to crack various Competitive Exams. Make use of our Current Affairs Feb 3 and current affairs India 2018 for better scoring in exams. Users will be benefited with the free month wise Current Affairs PDF and Updates available for download. The Free Quizzes & GK Questions available in this Affairs Section will benefit all the career hopefuls to get their desired Sarkari Naukri. This current affairs daily page is well created by the dedicated team members of recruitment.guru. Make use of Current Affairs Feb 3.